I Can. Therefore, I Will! …because you have the power - the power to mold your personality into someone you always wanted to be, the power to shape your future according to how you wanted to live, and the power to create your destiny as to how you wanted to make certain things happen. There's a saying that "If you think you can or think you can't, you're right." Is there any instance in your life that you refuse to do a particular job, say joining a beauty contest or singing in front of a crowd, because you think you can't do it? Too bad…You haven't started the competition yet, but you have already lost. The real harm is not believing in yourself - making you worthless and insignificant! What the 4th basic need of man is according to Maslow's heirarchy of needs. What the quotation "All the world is a laboratory to the inquiring mind" means. The reason behind the story of two brothers whose father is drunk - one becomes an alcoholic and the other becomes a professional. Just as long as you know how to properly train your mind to focus on important things, getting what you want will be as easy as snapping your fingers. Do yourself a big favor and get a copy now of I Can - Therefore, I Will. You can download your own copy of I Can - Therefore, I Will right now for only $27! 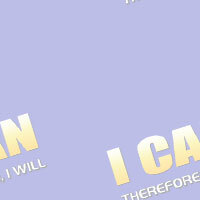 For a limited time, you can get I Can - Therefore, I Will for only $19.95! If for any reason you are not satisfied with all the life-changing mind power techniques this book teaches, please contact us and we'll refund all your money pronto. P.S. Your mind is the most powerful supercomputer in the world. It's a pity if you would not be able to explore and utilize its vast potentials. 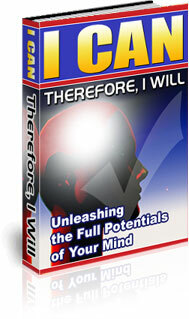 Unleash your mind power now!